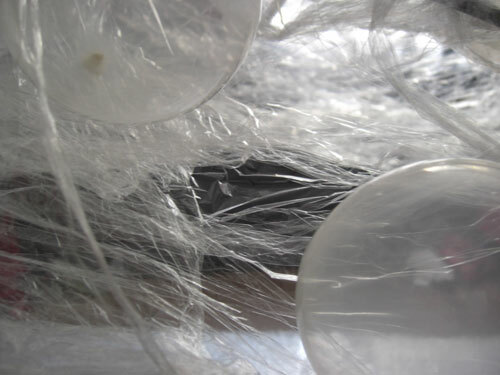 My next experiment for the dome was to do a cling film wrap with clear small balloons randomly spread both on the inside and outside of the dome. I gradually wrapped the cling film around each pole starting from the bottom and worked upwards to the top by criss-crossing around each pole. I used a different technique for the entrance, and added most of the balloons last since I didn't have that many. Some of the balloons that I used were far too big, but since they were all I had available at the time I decided to use these to see how they looked to get an idea. This was very time consuming but I really liked the effect. It had a slightly contradictory feel about it. On one hand it had a very magical feel, but it also felt slightly sinister too. The balloons reminded me of individual eggs in a cocoon that were either waiting to hatch or die. Being inside the dome made me think about the cycle of life and death and this was just within the space without any monitor playing a video or breathing sounds that would be also inside. I also need to work on my video/audio to be shown inside and think about the design for building a unit for the monitor/ speakers and laptop.